Just out of curiosity, but can Poser users now save in the DSON file format with this or is it just an importer ? This tool allows you to use Genesis (and Genesis-Content) inside Poser, you can't save with it in the DSON file format. In that case this is yet another no brainer by DAZ, I've just seen a post over at Rendo where someone done with Genesis what they normally do with other figures, ie load the figure, dial up a morph, apply a texture, load clothing and hair, and save it back to the figure library, 400 MB of their disk space vanished doing that, it wont take long to fill a 1TB drive doing that. Hmm wonder why the second half of my post didn't make it. Then there's the problem of content, it's odds on that people are going to start making content in P9/Pro12 for Genesis, and because they can't save in DSON means it wont be compatible with DS4, so our own figure will have content that we can't use on it. DS4 still reads Poser format files such as cr2's etc. so content created in Poser for Genesis shouldn't be an issue. But this is an importer since Genesis is not native to Poser, so you won't be saving any of Genesis' formats from Poser. Until then, content creation should be done in DS4 with the default genesis shape. I can already see people exporting the V4 shape from poser attempting to rig clothing to it and finding out that's not how you create genesis clothing especially when the clothing starts floating in the wrong places on different shapes. That won't work. Morphs and clothing need to be in the DSON format for Genesis. But you could make poser dynamics for genesis to wear. Unfortunately they won't work in DS. Putting a content folder, with its own Runtime folder, inside another content folder is likely to cause trouble. Since you are on a Mac you can, if you like, install content to the application folder (though it's still not advised as far as I know), or to a totally separate folder that you have told Poser to use as a library. That may not be the cause of your problem but it does sound as if the needed files aren't being found. - Genesis Stater Essentials TRX to a DS Content folder. - Genesis Starter Essentials Poser to an all-new Runtime folder not located in my regular Poser directory. - DSON Importer pointed at my main Poser Installation. And then make sure to point the Poser library at the first two folders, adding them as extra Runtimes. Poser's got to know where to look to find the files. How can I thank you ! It's like a miracle ! Thank you very much . Now, can I bother you ? I bought Textures,characters for M5 can I use them ? Do I have to update all my stuff ? im pretty sure there is something wrong with the 64bit installer in some cases..
Do your other Python scripts work, and is the DSON script in the same location? Find PoserPro.exe, from there navigate to Runtime\Python\addons\dson, right click on dzdsonimporter.pyd and choose properties. What is the size? I was so looking forward to using DSON for poser and was even about to spend $162 on both V5 & M5 pro mobel suite bundles but it's just not meant to happen. No matter what I do I can't get it to work. I've got Poser pro 2012 64bit SR3, I've installed all correct 3 files that were required including the DSON importer 64 bit version. re-installed my poser to a location outside of program files, installed the genesis starter essentials in its own directory on a seperate drive and in the poser directory itself, Ive tried opening from both places but they just dont work. Is there any way to import the morphs (example the hair)? will the 1.4_trx install the same files as before or more? The legacy files are for those running DS4 or earlier. If you are using DS 4.5 and/or Porser then you won't need it. If I convert a dress I have made for Genesis to the new DUF format and then make the Poser Companion Files. Can I distribute them and what exactly would I have to include in the package to make sure it works in both Poser and DS? Are there any instructions anywhere on how to package these files up so they can be distributed legally? First off, installing the SR3.1 for PP2012 is recommended. You don't need to move Poser anywhere, that stays in Program Files. Having installed DSON, I double clicked the Computer icon on my desktop, clicked Documents under Libraries and added a new folder in that Documents library called DAZ (the new folder effectively becomes a library) and installed all the Genesis stuff into that new library. (You specify the new library as a custom path when asked where to install the content.) In Poser, I added the new DAZ library to the main one i.e. the one that comes up when Poser launches. Doing this seems to add that new DAZ library to all the libraries and the relevant Genesis stuff can be found in those new DAZ libraries. It all worked like a charm after that. Below is a render, just to prove it did work. Yes, in fact it's the hope that content makers will provide the companion files so that their products are available to those who simply can't run DS at all (or who simply don't want to learn yet another application). You'd need the \Data folder for your dress, the DS users files (\People\Genesis\Clothing\Amethyst's Dress, or whatever), the \Runtime\Textures folders you use and the \Runtime\Libraries\... files with the companion files, including the second copy of the .dufs from the People folder. OKay got all the stuff installed but I am at a loss on how you even get genesis figure into poser. No Genesis folders show up in the poser libraries so where do I find the content? All my poser content files are in "My Documents" and this is where I pointed the GenesisStarterEssentials _1.6_trx and the GenesisStarterEssentialsPoserCF_1.6_dpc. I do not have DS installed on my PC so I don't understand what or why the trx file are needed to be installed. Could it be that the GenesisStarterEssentialsPoserCF_1.6_dpc needed to go directly into the PoserPro 2012 content file in order to show up in my libraries? There won't be any folders named Genesis - the base figure gets put in the DAZ People folder, alongside the older figures, if present. Thank you Daz - I did't have any problems to install the Scripts and the EssentialStarter Content. Since yesterday I have renewed my PC-Membership because now I can see you have a heart for Poser-Users. too. I love this possibility and thank you so much! Some M5 stuff I bought are updated in the store ( Genesis Evolution: Body Morphs, Yolande Hair etc ... ) but not in my downloadable item . Why ? Do I have to buy them one more time ? Sounds to me like you'll have to reset your downloads by going into your Itemised Order History. OK. 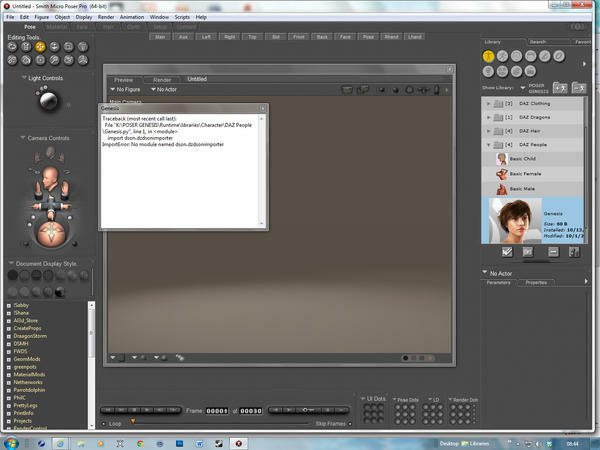 I have 64 bit laptop, 64 bit Windows 7, But I used 32 bit SR3.1 for Poser 9. Only because Poser 9 is 32 bits. It works for me. Hope this helps. Oh, not sure what to suggest now, I'm sure someone else will know. Anyway, thank you for your answer . I think I know where the confusion is happening. Poser stays where it is, you do NOT need to move this out of Program Files. I went into Computer and opened up the Documents library. I put a new folder in there called Daz, this in effect is now a library. Install the Genesis content into this library by specifying a custom installation. In Poser you add this new Daz library and all the relevant Genesis content is placed into the relevant libraries. There does appear to be a lack of clarity in the DSON instructions. Anyway, this does work, as I said on the previous page to this one. OK. I keep hearing everyone talking about going to their Documents folder. What is suppose to be in it? I looked at mine, and I have nothing that pertains to Daz or Poser 9 in it. That looks very useful, but, there's no mention of DSON in the blurb, so does that mean it still needs converting!? That DSON list is starting to get confusing, particularly when things like that are included which don't appear to have been converted. Poke-away is rather an old product -when DS4 first came out, as a beta, it wasn't possible to hide body parts and the morphs were an alternative. However, they fixed that quickly (before the official release). Fortunately, since these are just morphs they don't need .duf files and do seem to work in the current version with the importer - they just appear as a group of morphs at the bottom of the list. You can also hid body parts by setting their Subdivision Exclude parameter to 1. In the image I set the collar's SubD exclude to 1 and applied the X-Away Left arm morph, so you can see both working in PP2012. Ah, thanks for that! Took some digging to find the reply. I'll give that one a go when I get all the other stuff. There doesn't need to be. What the contents of this folder are are writable libraries. All you do is create one and install your Genesis content into it. You then add this new library in Poser (That's the folder icon with the + sign.) and DSON will work. It did take me a little while to fathom that this was what the DSON instructions wanted me to do, but, it worked. By default Vue stores it's content in the Documents library and it was that which made me realise what I needed to do. I made a Poser 9 Content folder on my external hard drive. That is where I put all content for Poser, even the Genesis stuff. It works for me. And, with more and more stuff I keep putting in Poser, it doesn't bog down my laptop hard drive. The external hard drive is bigger than my laptop hard drive. Thanks for telling me what it is. Hi. I've managed to get DSON working for me in poser 9 but not fully as I still have the frozen library. I've installed the M5 pro package but I can't seem to locate the M5 gens in poser 9's library. Are the M5 Gens compatible yet?